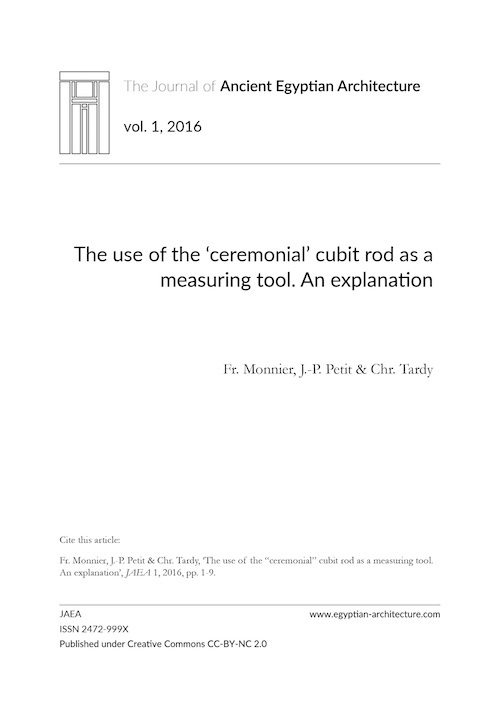 The use of the ‘ceremonial’ cubit rod as a measuring tool. [FR] Une version française de cet article est disponible à cette adresse. The so-called1 ceremonial cubits, the majority of them fragmented and incomplete, incorporate a remarkable quantity of technical inscriptions given their compact dimensions.2 While it has been established that the texts are mostly of a religious nature with an apotropaic character, information about timekeeping and distance measurements collected on them clearly reveal another more technical role as vade-mecum and official standard.3 In spite of that evidence, previous studies have not yielded a full understanding of the inscriptions which are engraved on these singular objects. The oldest examples of the so-called ceremonial cubits date back to the New Kingdom.5 In addition to their symbolism they are distinguished from the more common cubit rods by the prestigious material utilized for their manufacture; stone or metal (wood is more rarely used),6 and by the wealth of texts and information that would appear to have been superfluous for ordinary measuring tools (see below). Fig. 1. Maya’s cubit (18th Dyn., Louvre Museum, N 1538) (photo courtesy of Alain Guilleux). 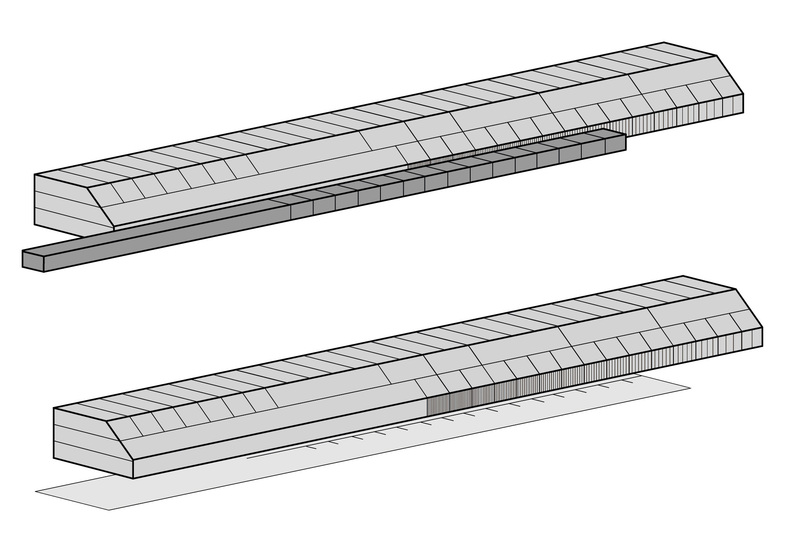 When accurately made, they employ a sleek section in the form of a long parallelepiped rectangle and are 0.523 m long. This is the exact length of a royal cubit (mH nswt).7 The section has a chamfered top edge, and with the inclusion of the ends this results in a total of seven faces, which will be referred to using the letters from A to F, according to the nomenclature established by Adelheid Schlott-Schwab.8 The carved inscriptions on these objects can be summarized in five main groups. The graduations and associated metrical nomenclature are the most regularly reproduced information on all of the cubit rods. These rods adopt a digital system which consists of dividing the royal cubit into 28 fingers and multiples of fingers.9 The multiples include the palm (4 fingers), the hand’s breath (5 fingers), the fist (6 fingers), the double palm (8 fingers), the small span (12 fingers), the great span (14 fingers), the sacred cubit (16 fingers), the remen cubit (20 fingers), the small cubit (24 fingers) and the royal or pharaonic cubit (28 fingers).10 Finally, the last fifteen fingers of the graduated part are further subdivided successively into 2, 3, 4, 5, ..., 14, and 16 equal parts. All the subdivisions are finely cut and emphasized with white paint, and are superscripted by their unit fractions written in hieroglyphs. Fig. 2. Ceremonial cubit of Osorkon II (Cairo Museum, RT 31/12/22/2) (photo courtesy of Alain Guilleux). This symbolic aspect cannot overshadow the origin and the significance of the usual information that is found on these miniature monuments. Mostly they are of a technical nature, and all of them are related to spatial and chronological measurement. These cubit rods are ritual and factitious objects, above all symbolic and not intended for a technical or a practical use. As a matter of fact, they often incorporate mistakes,36 and the graduations are sometimes clumsily drawn.37 There can be no doubt that there was one, or even several standard rods, which were closely guarded and better manufactured to the expected accuracy, reference objects that inspired the replicas under discussion in this paper. This does not affect the analysis and the interpretation of the inscriptions whose meaning was not related to the quality of the reproduction. The arrangements of the graduated parts show great consistency from one cubit to another. These cubit rods allow easy measurement of lengths that are equal to a whole number of fingers, and the expression of these in the required units of palms, small or great spans, sacred cubits, and so on. It is more complicated, at first sight, to see how they could have been used to take measurements involving subdivisions of a finger such as those listed on the face C.
Our modern numerical system is established on a base 10 just like in Ancient Egypt. This allows us to write decimal numbers which are in fact fractions of whole numbers over powers of ten. That is the reason why our rulers are graduated in decimeters, centimeters and millimeters; each part being equal to the tenth of the previous one. The Egyptian numerical system was fundamentally different in its treatment of numbers less than one, as it used unit fractions to decompose single units into equal parts. A measurement less than one finger was then expressed as 1/2, 1/3, 1/4, 1/5, ... down to 1/16th of a finger, which means in fact that the finger was divided into 2, 3, 4, 5, ... or 16 equal parts.38 As it was materially impossible to graduate all these measurements in one single section, the Egyptians wrote the different subdivisions on subsequent divisions, one after the other in decreasing order. Such a point of view is surprising when one sees the contextual importance of the recorded data on these objects. It is very clear that the fractional subdivisions are an integral part of the graduated ruler and its measuring system. We will show that there is a clever practical measurement method that may explain the ordered fragmentation of digits, almost down to millimeter lengths. It is unlikely that the system of subdivisions utilized would have required the user to move the ruler to take measurements in two stages (in fingers, and then in fractions of a finger). Such a clumsy process would contradict the demonstrated precision of the subdivisions. In fact, everything seems to indicate that the subdivisions are there to respond to various specific cases when the object to be measured did not coincide with a whole number of fingers. If this cubit rod is used in conjunction with another, or with a simpler ruler subdivided only into whole fingers, the related graduations reveal a noteworthy property. The user first has to position the cubit rod alongside the object to be measured, then hold one side of the ruler against the rest of the cubit. The whole digit lines on this same edge then act as cursors that align against the cubit, either at an existing graduation, or between two graduations (fig. 4). In this last case the periodic offset of the ‘cursor’ from one finger to another on the ruler means that it eventually reaches a location where it coincides exactly with one of the fine cubit’s subdivisions. A reading has to be taken at this coincidence and added to the number of whole digits measured alongside the object. Practical experimentation shows that this technique is undoubtedly effective, and this can explain the presence and arrangement of the subdivisions. According to our reconstruction, accurate measurement would have certainly required the use of the additional element that we suppose to be a ruler or a second cubit rod, but we can also imagine that a stem or a simple annotated papyrus could serve equally as well, with the benefit that they could be made and marked out by the scribes or artisans using the cubit rod which was available to them. Several similar and plausible scenarios can be envisaged. Fig. 4. The measuring method using a cubit rod and rule together suggested by the authors. Animation 1. Animation showing the use of the cubit rod as a measuring tool. Animation 2. Animation showing the use of the cubit rod as a measuring tool. As the subdivisions are only spread over 15 fingers, accurate measurement can be applied using this full method only to the lengths less than 10 fingers. Beyond this value all the subdivisions are no longer in a position available to read. This research has led to a plausible interpretation of an obscure part of the inscriptions reproduced on the ceremonial cubit rods. 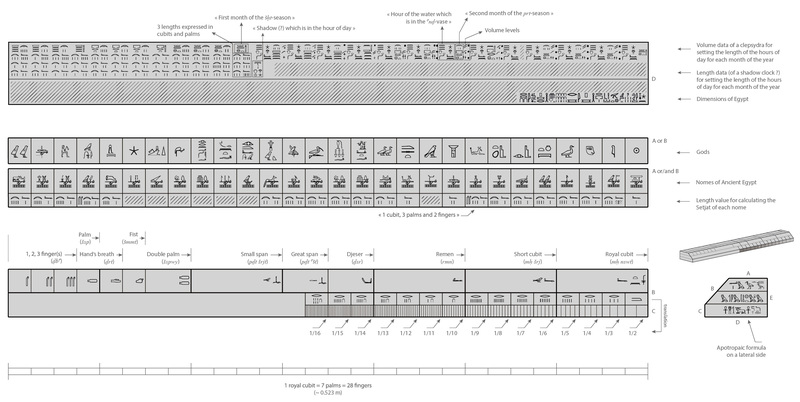 The arrangement of subdivisions makes a coherent set for measuring objects, following a technique that would have been easily available to Ancient Egyptians. It is highly doubtful that the graduations set out in order and engraved with a great accuracy on these cubits were conceived in that way without any practical purpose. The explanation presented in the second part of this article demonstrates that the graduated ruler of such cubit rods was fully operational on the condition that it was used in conjunction with another metrical element (a cubit rod, marked papyrus, or marked reed stem). The measuring method we suggest would have been dedicated to small subjects requiring precision,40 prefiguring in a rather primitive, but nevertheless rather clever form, the Vernier caliper that was invented during the 17th century A.D. Fig. 5. Two possible methods for using fractions of a finger in the measurements. Arnold, D. (1991), Building in Egypt. Pharaonic Stone Masonry, New-York/Oxford. Borchardt, L. (1920), Die Geschichte der Zeitmessung und der Uhren, Berlin/Leipzig. Boylan, P. (1922), Thoth, The Hermes of Egypt, Oxford. Carlotti, J.-Fr. 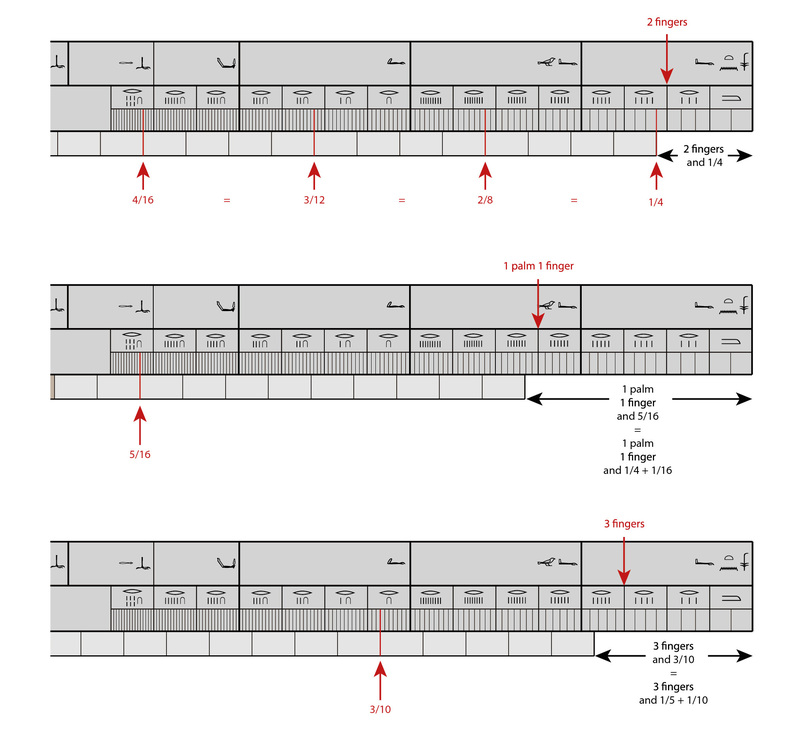 (1995), ‘Quelques réflexions sur les unités de mesure utilisées en architecture pharaonique’, Les Cahiers de Karnak 10, pp. 127-140. Chassinat, É. (1930), Le temple d’Edfou V, Cairo. Chassinat, É. (1931), Le temple d’Edfou VI, Cairo. Chassinat, É. (1932), Le temple d’Edfou VII, Cairo. Clagett, M. (1995), Ancient Egyptian Science. A Source Book, vol. 2, Calendars, Clocks, and Astronomy, Philadelphia. Clagett, M. (1999), Ancient Egyptian Science. A Source Book, vol. 3, Ancient Egyptian Mathematics, Philadelphia. Gabra, S. (1969), ‘Coudée votive de Touna el Gebel Hermopolis Ouest. La Khemenow pa Meket des Egyptiens’, MDAIK 24, pp. 129-135. Graefe, E. (1973), ‘Einige Bermerkungen zur Angabe der sTAT-Grösse auf der Weissen Kapelle Sesostris I’, JEA 59, pp. 72-76. Hart, G. (2005), The Routledge Dictionnary of Egyptian Gods and Goddesses, London/New-York: Routledge. Lacau, P.and Chevrier, H. (1956), Une chapelle de Sésostris Ier à Karnak, IFAO, Cairo. Lepsius, K. R. (1865), Die Alt-Aegyptische Elle und Ihre Eintheilung, Berlin. Lightbody, D. I. (2008), Egyptian Tomb Architecture. The archaeological facts of pharaonic circular symbolism, Bar International Series 1852, Oxford. Michel, M. (2014), Les mathématiques de l’Égypte ancienne : numération, métrologie, arithmétique, géométrie et autres problèmes, Bruxelles: Safran. Petrie, W. M. F. (1926), Ancient Weights and Measures, BSAE 39, London. Posener-Kriéger, P. and Cenival, J.-L. (1968), Hieratic Papyri in the British Museum. Fifth Series. The Abu Sir Papyri, London. Posener-Kriéger, P. (1976), Les archives du temple funéraire de Néferirkarê Kakaï, BdE 65, Cairo. Saint John, M. (2000), Three Cubits Compared, London. Sarton, G. (1936), ‘On a Curious Subdivision of the Egyptian Cubit’, Isis 25-2, pp. 399-402. Schlott, A. (1969), Die Ausmasse Ägyptens nach Altägyptischen Texten, Tübingen. Schlott-Schwab, A. (1972), ‘Altägyptische Texte über Ausmaße Ägyptens’, MDAIK 28, pp. 109-113, taf. XXIII-XXVIII. Schlott-Schwab, A. (1981), Die Ausmasse Ägyptens nach Altägyptischen Texten, Wiesbaden. Scott, N. E. (1942), ‘Egyptian Cubit Rods’, The Metropolitan Museum of Arts Bulletin 1- 1, pp. 70-75. Zivie, A.-P. (1972), ‘Un fragment inédit de coudée votive’, BIFAO 71, pp. 181-188. Zivie, A.-P. (1977a), ‘L’ibis, Thot et la coudée’, BSFE 79, pp. 22-41. Zivie, A.-P. (1977b), ‘Un fragment de coudée de la XIXe dynastie’, RdE 29, pp. 215-223. Zivie, A.-P. (1979),‘Nouveaux aperçus sur les “coudées votives”. L’apport original de deux fragments provenant de Basse Égypte’, in J. Vercoutter (dir. 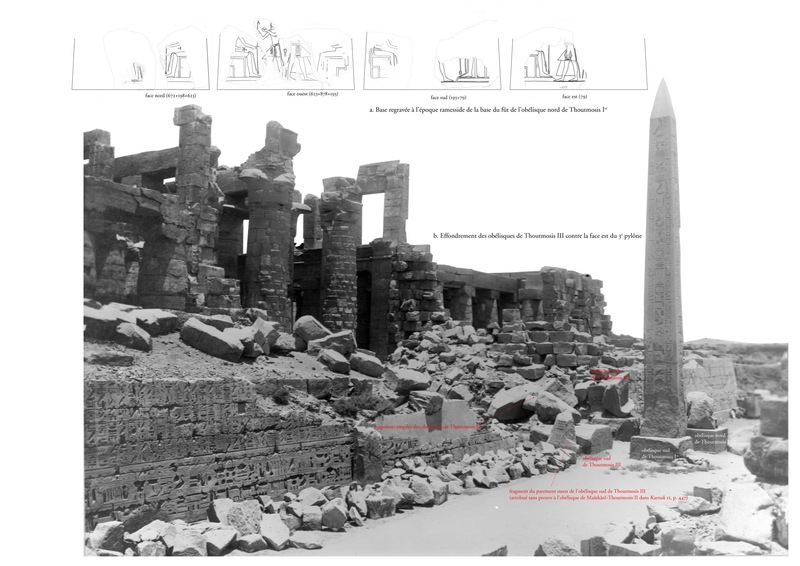 ), Hommages à la mémoire de Serge Sauneron, I, BdE 81/1, IFAO, Le Caire, pp. 319-343, pl. 49-50. Zivie, A.-P. (1990), Découvertes à Saqqarah : le vizir oublié, Paris: du Seuil. von Bomhard, A.-S. (1999), Le calendrier égyptien. Une œuvre d’éternité, London: Periplus Publishing. We gratefully acknowledge Alain Guilleux for providing the photos for the article, and David Ian Lightbody for proof-reading the english text. Readers should refer to Lepsius (1865); Petrie (1926), pp. 38-42, pl. XXIV-XXV; Scott (1942); Schlott-Schwab (1981); Clagett (1999), pp. 9-15, fig. IV.24-IV27e; Zivie (1972); Zivie (1977a); Zivie (1977b); Zivie (1979). Maya’s cubit rod (18th Dyn., Louvre N 1538) and Amenemope’s cubit rod (18th Dyn., Turin no. 6347) (Saint John (2000)). Maya’s cubit rod (18th Dyn., Louvre N 1538) and Any’s cubit rod (20th Dyn., Liverpool Museum 03/061/4424). or ‘great cubit’ (Carlotti (1995), p. 129). Lacau and Chevrier (1956), pp. 216-217; Schlott-Schwab (1981), p. 32; Graefe (1973). Graefe (1973); Zivie (1979), pp. 335-336. In all cases, the adjustment was carried out by a subtraction. The 100 cubits value represents an upper limit for the calculation of the setjat. Lacau and Chevrier (1956), pp. 216-217. Saint John (2000), p. 2.
von Bomhard (1999), pp. 66-69. Borchardt (1920); Clagett (1995), pp. 48-165; von Bomhard (1999), p. 66 (n. 26-28). Schlott-Schwab (1981), p. 49; Schlott-Schwab (1972), pp. 109-110. Data which are collected on the walls of the white chapel at Karnak (Lacau and Chevrier (1956), pp. 242-243). Schlott-Schwab (1981), p. 50. These measurements are also replicated on the white chapel at Karnak (Lacau and Chevrier (1956), pp. 246-247). Liverpool Museum 03/061/4424 (Link [date accessed : 11 june 2016]). Lightbody (2008), fig. 8, p. 6 (translation by Angela McDonald). Edfou VII, 126, 15 et 127, 7.
mH tp-Hsb (Gabra (1969), p. 130). Schlott- Schwab (1981), pp. 46-47. See also Zivie (1977a), p. 34. Zivie (1977a), p. 26; Hart (2005), pp. 156-159. Zivie (1979), pp. 335-336; Lacau and Chevrier (1956), pp. 245-246, 248. Lepsius (1865), p. 18 ; Sarton (1936), p. 401; Zivie (1972), p. 185, fig. 2. Some of them even comprise an incorrect number of graduations (Saint John (2000), pp. 14-15). Sarton (1936), pp. 401-402; Michel (2014), pp. 120-121. 1/16th of a finger is equal to 1.2 mm. Known mathematical texts do not detail any calculation involving such precise values (Michel (2014)). There is however one document in the archives of Abusir that reveals the measurement of an object with dimensions of fractions of a finger: pBM EA 10735 sheet 17 (Posener-Kriéger and Cenival (1968), pls. 23-24; Posener-Kriéger (1976), pp. 143-144, fig. 7). We would like to thank Luca Miatello for having brought it to our attention.